Research based project started at Bundanon Trust in Australia in November 2013, looking at the 20 worst invasive species introduced to Australia. Most of these weeds could be found in the grounds of the Trust. 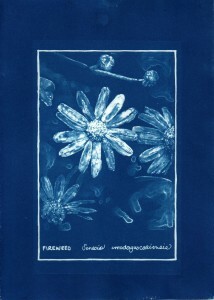 After hand-drawing each sample, I employed a cyanotype printing technique to reproduce 11 of these weeds, with the remaining 9 still pendant.